ACE Hardware: Sign up for ACE Rewards and get a $5 off coupon on your birthday. American Eagle Outfitters: Sign up for AERewards and get 15% off during your birthday month. Aveda: Become a member of Aveda.com and get a free gift every year on your birthday. Bare Minerals: Become a Friends and Benefits member and get a gift customized to your personal profile on your birthday. CVS: Register for a CVS ExtraCare Card and get $3 in ExtraCare Bucks every year on your birthday. Disney: Register for Disney Movie Rewards and you’ll receive a credit for a free Blu-ray movie on your birthday. DSW: Join DSW’s rewards program and receive a $5 gift certificate on your birthday. Old Navy: Sign up for Old Navy’s email newsletters and you’ll receive a free surprise on your birthday. Sephora: Sign up for Beauty Insiders and receive a complimentary gift during your birthday month. Victoria’s Secret: Sign up for their mailing list and receive a coupon for $10 off a purchase of $10 or more on your birthday. Marble Slab Sign up for Marble Mail and receive exclusive offers, birthday surprises and more. Kids under age 13 can join the Marble Slab Kids Club and get a free ice cream cone on their birthday. When you register a Starbucks card, they will send you a free drink or food reward on your birthday! If you have a child ages 2-10, sign them up for Geoffrey’s Birthday Club at Toys R Us. They will receive a birthday card and surprise gift from Geoffrey. Enjoy a free sub on your birthday when you join the Firehouse Subs Birthday Club here. Or, just show an I.D. with your birth date on your birthday and you’ll get a FREE medium celebratory sub. Join the Fudds Club to get the latest news and perks from Fuddruckers – Like a special gift for joining, plus a birthday treat and a surprise on your anniversary date! Join the So Connected club at Ruby Tuesday’s and you’ll get an email for a free burger on your birthday. Join Jason’s Deli’s email list and you’ll receive a $5 gift card on your birthday. Keep your Chick-fil-A Email Insiders information up to date for exclusive promotions to your inbox. Abuelo’s: Join their eClub and receive a free gift for signing up, plus gifts on your birthday and anniversary. Applebee’s: Sign up to receive their email updates and you’ll get a dessert shooter on your birthday. Atlanta Bread Company: Join the Atlanta Bread Company VIP eCLub and you’ll get a free cookie on your birthday. Baker’s Square Restaurant & Pies: Sign up for their email newsletters and you’ll receive a coupon for a free entrée right away, plus a free slice of pie on your birthday. Ben & Jerry’s: Become a Chunk Spelunker and you’ll get a free scoop of ice cream on your birthday. Bennigan’s: Become a Bennigan’s eClub member and receive a free dessert and buy one, get one entrée on your birthday. Black Angus Steakhouse: Join their Prime Club and receive a free steak dinner (with purchase of a second entrée) on your first birthday as a member. Brio Tuscan Grille: Sign up for Posta Toscana at Brio Tuscan Grille and you’ll receive a coupon for free food on your birthday. Buca di Beppo: Register for their eClub updates and receive a free brownie on your birthday and a free dessert on your anniversary. Captain D’s Seafood Kitchen: Become a Captain D’s Seafood Restaurant Insider and receive a free fish or chicken dinner for joining, plus more freebies on your birthday. Charlie Brown’s Steakhouse: Join their Handshake Club and receive a free gift on your birthday. Chili’s: Sign up for their email list and get a free order of chips and salsa or guacamole or queso just for joining, plus a brownie sundae on your birthday. Cold Stone Creamery: Join their club to receive a coupon for free ice cream on your birthday. Dairy Queen: Join their fan club and receive a free Blizzard on your birthday. Del Taco: Join their Raving Fan eClub and receive a free premium shake on your birthday, plus two free Grilled Chicken Tacos just for signing up. Denny’s: Join their rewards club to receive a free Grand Slam on your birthday (includes two eggs, two slices of bacon, two sausage links and two pancakes). Don Pablo’s: Join their Hab Club and receive a free $10 gift card on your birthday. Famous Dave’s: Join the Be a P.I.G. (Pretty Important Guest) Club and receive something free on your birthday. Flat Top Stir-Fry Grill: Join their eClub and get a free stir-fry dish on your birthday. Friendly’s: Join their BFF Club and get a free three-scoop sundae just for enrolling, as well as free birthday offers for your entire family. Fuddruckers: Join the Fudd Club and get a free treat on your birthday. Genghis Grill: Become a member of the Khan’s Club and get a free birthday stir-fry bowl. 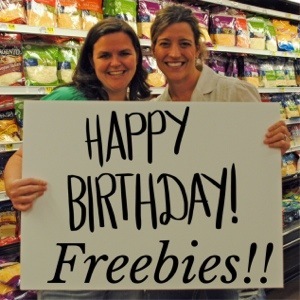 Gold Star Chili: Join their eClub for free surprises on your birthday. Great American Cookies: Join their Cookie-Mail Club for free birthday surprises. Houlihan’s: Join their email club and get a free appetizer for joining, plus a free entrée on your birthday. IHOP: Join their Pancake Revolution and receive a free meal for signing up, on your birthday and on the one-year anniversary of joining. Johnny Rocket’s: Join the Johnny Rocket eClub and receive a free hamburger on your birthday. Krispy Kreme: Join the Friends of Krispy Kreme eClub and get a free doughnut and coffee on your birthday. Menchie’s: Join the mySmileage rewards program and recieve a $5 credit towards frozen yogurt on your birthday. Moe’s Southwest Grill: Join their eClub and receive a free gift on your birthday. Outback Steakhouse: Join their rewards program and receive a free dessert on your birthday. P.F. Chang’s: Sign up for their email updates and get a free dessert on your birthday. Qdoba Mexican Grill: Sign up for their rewards program and receive a free chips & salsa or a free regular drink for registering, plus a free gift on your birthday. Red Lobster: Join their rewards club and get a free gift on your birthday. Red Robin: Join their eClub and get a free burger with bottomless fries on your birthday. Rita’s Ice: Join their birthday club for a free treat on your birthday. Schlotzsky’s: Join their eClub to get a free small sandwich on your birthday. Sonic Drive-In: Sign up to become a Sonic Cruisers member and you’ll receive a free surprise on your birthday. Spaghetti Warehouse: Join the Warehouse Club and get a free appetizer for signing up, plus a complimentary meal on your birthday. Starbucks: Join their rewards club for a free drink on your birthday. Taco Cabana: Become a TC Fanatic and get a free fajita taco for joining, plus a free TC Fanatics flauta plate on your birthday. TCBY: Sign up for the myTCBY eclub and recieve a free small yogurt on your birthday. UNO Chicago Grill: Join their rewards program and get a free meal on your birthday. Barnes & Noble: Sign up for their Kids’ Club and your child can receive a cupcake on their birthday. Bashas’: Register your child in their Birthday Club and they’ll receive a free cake every year through age 10. Bob Evans: Sign your children (12 and under) up for the Bob Evans Birthday Club and the’ll receive free kids’ meals on their birthday. California Pizza Kitchen: Sign your children (10 and under) up for the CPKids Birthday Club and they’ll receive a free meal during their birthday month. Chuck E. Cheese’s: Join their email club and receive special offers and freebies for your child’s birthday. Kmart: Join their Birthday Club and get a $5 gift card for your child’s birthday, plus a birthday gift pack. Make an account at BirthdayFreebies.com. You can search for freebies at retailers and restaurants in your area by typing in your zip code.